Click here to join the Facebook group, and over 12,000 members, for free! This post contains affiliate links. I may receive compensation if you purchase products using my links. Thank you for supporting The Life You Love! Before you begin reading, I just wanted to let you know that I also created an audio recording/podcast for this blog post. It has slightly different wording, but basically the same message. I just wanted to offer an alternative way to get my message for people who connect better with voices and audio! Let me know if you read my blog post or listening to the audio. If you did listen to the audio, please let me know what you think of this new addition! The best way that I know to describe it is like praying and asking for help. When you pray, you ask God or your Higher Power for something, you promise that you're willing to work for it, you show how dedicated you are to receiving it, and then you tell God that it's in His hands. That's how manifesting is, but I believe it comes from the Universe. I'm a spiritualist and I believe EVERYTHING AND EVERYONE in the Universe is connected to each other. When you set your intentions to manifest something, you are showing the Universe that you truly want what you're manifesting and you truly trust the Universe to take care of you in the way that is best for you. Let me tell you the story before I tell you the resource I used. Because after I tell you this story, you're going to have chills and you're going to purchase the book IMMEDIATELY. Promise. On a day off from work, I called my mom to catch up. This turned into a 3-hour long conversation. We talked about how everyone is doing, future vacations, and just life in general. I told my mom that I wasn't concerned about student loans because I was fortunate enough to graduate from undergrad without any student loans. Now that I'm in graduate school, it's my turn to experience the world of loans. We also talked about our debt - personal, car, etc. We talked through some strategies and some ideas to help me feel like I was doing enough with what felt like not enough. It was a pleasant, uplifting conversation and I felt like I was ready to take control of my life by letting go of control. When you let go of control, you show the Universe or God or your Higher Power that you are ready and you are open to receive. When we got off the phone, I immediately opened my notebook and pulled up my Kindle version of Unleash Your Inner Money Babe. This is a self-help workbook that shows you how to manifest $1,000 in 21 days. That doesn't include money that you expect or money that you receive from regular income. Just out of the blue, unexpected money. I opened up my book and read the information for Day 3. Then I started the task for the day. 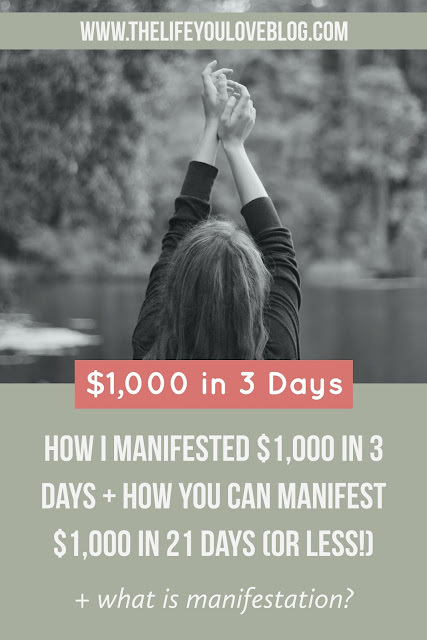 List 5 feelings that you'll experience when you manifest your $1000 in 21 days. Then actually feel them. Alright. After I wrote that list, I imagined what it would actually feel like. I imagined that I had that money and I was actually able to use it and feel how I would feel when I had it. This whole thing took maybe 3 minutes. My mom called me back as soon as I closed my laptop and my notebook. She said that she felt like she hadn't done enough just by talking to me and told me that she and my dad were gifting me $1,000. I stuttered and stammered for a second. And then I bawled. I bawled my freaking eyes out. I had never mentioned this book to my mom. 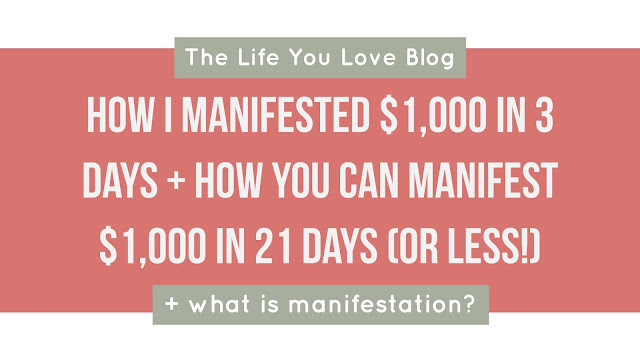 I never said, "Oh, I'm trying to manifest $1,000 out of the blue. Haha, not weird at all, right?" I told her about the book. I told her about my goal of manifesting $1,000 in 3 weeks. She replied that she had debated on how much to give me, but $1,000 kept popping into her mind. And she told me that that's why she believes that we're all connected and everything happens for a reason, just like I believe. I cried and cried and cried and thanked her a million times. I didn't know what to say besides thank you and I love you. I really still don't. This is why I believe in connection and synchronicity. My parents have always been such givers. And I've always had such a hard time receiving. But I told the Universe that I was ready to receive and I had a manifestation goal. And it answered through my parents. You can use manifestation even if you're atheist, Christian, Buddhist, Jewish, or a spiritualist like I am. You can replace manifest with pray. In the end, I believe that the same thing happens to all of us and we were all searching for a connection to the Higher Power of this world in our own ways. Now go purchase your copy of Unleash Your Inner Money Babe. I don't care if it's an ebook or a physical copy. Do exactly what the book says. And mean it. Mean every damn thing that you do or say. You owe yourself that much and you will be rewarded for it. Trust me, I thought, "There's no freaking way that this will actually work. Seriously, where would that money even come from?" Still, I decided that I was going to trust and put my heart and soul into this manifestation. I never once thought about my parents. They have always helped me in every way that they can, but they never crossed my mind. It was so unexpected and just truly amazing. If you enjoyed this post about money manifestation, please pin this image and share it with your friends. Thanks for supporting The Life You Love!